Have you noticed how most crêpe recipes make A LOT of crêpes? I live in a very small household, and well, I don’t want to stand in front of the stove for ages making way more crêpes than I need. Yeah, yeah, I know they freeze well, but I can guarantee you that I will forget that they’re there and then they’ll have to be thrown out. Both buckwheat crêpe recipes that I had flagged would have made between 16 and 20 crêpes. I also noticed that they both combine buckwheat flour with regular flour. Enter Gluten-Free-Girl and the Chef. Not only do they provide the ratios for perfect crêpe batter, so you can make as many as you want, they offer up a cute little how-to video and their recipe uses only buckwheat flour. The filling takes a bit more work than the standard ham and cheese, but I promise it’s worth it. The caramelised leeks and the smoked cheddar combine to create such a sweet but smoky flavour that even carnivores won’t miss the ham or bacon in these crêpes. Speaking of, smoked cheese is this month’s Cheese, Please! 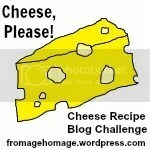 Blog Challenge over at Fromage Homage. If you haven’t visited this awesome blog yet, you are missing out! Buckwheat crêpe recipe from Gluten-Free-Girl and the Chef. Depending upon the size of your frying/crêpe pan, this recipe will make 4 to 6 crêpes. Notes about crêpe making: The first one is usually crap and full of oil. But don’t get discouraged, crêpes are really easy to make once you find your own knack for making them. Also, depending on the size of the pan, you may need to add more or less crêpe batter in order to coat the entire surface of the pan – start with a 1/3 cup and add more if needed. First, prepare the buckwheat crêpe batter. Whisk together the milk and eggs. Add the buckwheat flour and salt. Whisk together fully. Set aside for the flavours to mingle fully at room temperature while you make the filling. In a large, heavy-based frying pan, heat the butter over medium-low heat. When the butter just begins to sizzle, add the sliced leek, thyme, sage and salt and stir to coat. Allow to cook for 5 to 7 minutes, stirring frequently, or until they begin to soften. Add the frozen peas and the ricotta and stir to combine. Allow to cook for another 2 minutes or so, or until both the peas and the ricotta have heated through. Remove from the heat and set aside. Quickly re-whisk the crêpe batter. The starches in buckwheat flour tend to sink to the bottom so the batter must be whisked before cooking each crêpe. Set a cast-iron skillet or crêpe pan over low heat and slowly bring it up to medium-high heat. Add some of the coconut oil. When the oil has melted, add a 1/3 cup of the crêpe batter and immediately swirl the pan until the batter covers the entire surface. When the edges are set and starting to curl up from the pan, about 30 seconds to 1 minute, run a metal spatula under all the edges of the crêpe. Flip the crêpe. Cook for 30 seconds then turn the crêpe out onto a baking paper covered surface. Repeat with the remaining crêpe batter, making sure to separate each crêpe with baking paper. When all the crêpes are cooked, add about a ¼ cup of the filling to the middle of each crêpe, top with a generous portion of smoked cheddar and fold into rolls or quarters. I don’t think I’ve ever had smoked cheddar, the buckwheat pancakes and filling look delicious! Thanks, they were delicious! Smoked cheddar is quite lovely though it can be overpowering in some instances. Try it out with some smoked dutch cheese next time you have to make a nibblie platter. Lovely, herby, cheesy crepes – they sound delicious. For some reason I always associate eating crepes with cold weather, probably because I buy them at winter fairs and similar. So the smoked cheese would work really well, if you’re all wrapped up against the chill, trying not to get cheese on your gloves. Perhaps with a glass of mulled wine? !… Thanks for sharing with Cheese, Please! I absolutely adore crepes! We’ve got this cute little crepe stand that opened up in an old news stand, and every time I pass it, rain or shine, I will always stop and get one. Mulled wine would be great, especially if you’re not out in the nasty weather! I decided I want to start incorporating buckwheat in some of my recipes, just bought a bag. Never thought of using in crepes. Really nice and cheesy. Love this! Thanks! Buckwheat crepes are really yummy, I’m sure you will love them! Now I’m not sure of the validity of this piece of info as I can’t remember where I read this, but apparently buckwheat flour needs to be stored in the fridge… I will investigate further and let you know! Love this combination! Delicious, sprang to mind. And so good to have a recipe for, ahem, one person. And I won’t be freezing the rest, either! I do like this! I have never made crepes but my mom used to make them. Wonderful! There is something about the combination of leeks and cheese which really brings a sense of comfort and cosy to mind. Thanks! The first crepe is always a little wrong and very oily, so I let it cook properly on both sides and usually discard it, or leave it at the bottom of the pile so it can help keep the rest warm. I’m no expert, but once you figure out your own way of swirling and flipping, they are very easy to make. I love this filling idea… leeks and cheese are brilliant together, but I would never have thought to use a smoked cheese. I really should try using buckwheat flour in crepes too – it would make a nice change from the regular ones.